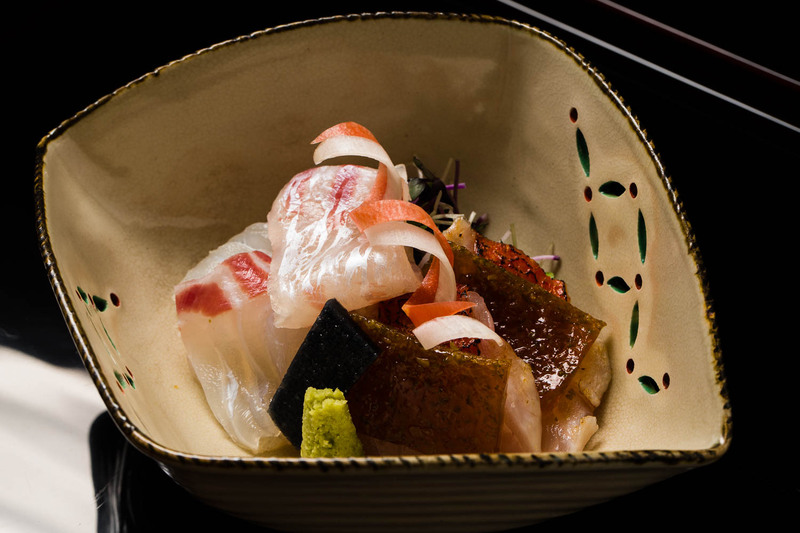 With pronounced seasonal flavors of Kyoto served at a perfectly modulated tempo, Roan Kikunoi offers the excitement of a live performance with front row seats at the counter of this talented chef. Found in a busy pocket of Kyoto off Shijo Boulevard, there is a unique energy and casual feel here. While the parent restaurant may be better known, the younger Chef Murata’s relaxed demeanor sets Roan Kikunoi apart, and you can still be assured of the same quality refined Japanese cuisine. 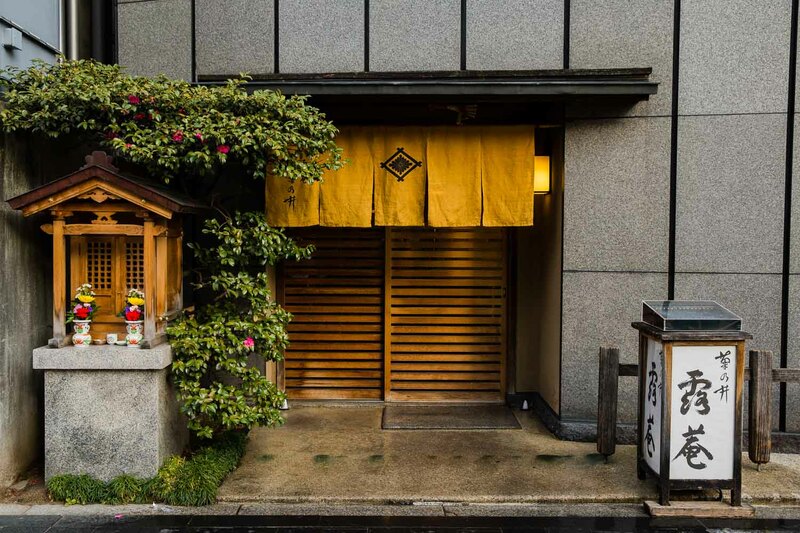 Roan Kikunoi is part of the Kikunoi group established in 1912 and now one of the most famous restaurants of Japanese cuisine the world over. This restaurant first opened in 1976 as Kikunoi Kiyamachi and was reinvented in 1989 as Roan Kikunoi. It is run by Yoshiharu Murata, the younger brother of Kikunoi chef Yoshihiro Murata. The name was given by Tenryuji Temple’s head priest and Zen teacher Hirata Seiko, whose calligraphy characters adorn the restaurant’s sign and draped noren which every guest passes through. The inspiration for the name came from a Zen saying “Meirekireki rododo” and was given with a wish for Murata to take a sincere and confident approach to his own cuisine without being restrained by tradition. Found just south of Shijo Kiyamachi, this busy little area is steeped in the charm of the nearby Takasegawa River. It is easy to access with Kawaramachi station nearby, but as soon as you pass through the noren and step inside, a quiet and distinctly Japanese space awaits allowing you to leave all the noise of the city behind. Your eyes are immediately struck by a large work of calligraphy with the characters for Fukasetsugetsu, referring to the emotions and sentiments we have in response to nature’s beautiful landscapes – perfect words for a restaurant serving flavors that mirror the shifting seasons. The first floor has two elevated seating areas and a ten-seat counter, the latter being the key distinguishing factor from the Kikunoi main restaurant which has only private rooms. Ahead of its time, this was one of the first restaurants to serve authentic Kaiseki cuisine at a counter. Throughout the meal you can witness the chefs’ swift yet delicate movements and quiet conversations. This proximity to the guests and clever use of a compact space occupied by four or five chefs mean every dish reaches you at its absolute best, from chilled items to those best enjoyed piping hot. The second floor takes on an entirely different appearance with tatami mat traditional rooms and even a tea room. It is a kind of status symbol to have a tea room – a dream of every high-end restaurant in Kyoto. When the restaurant was recreated as Roan Kikunoi, Murata chose Sotoji Nakamura, the leading architect of sukiya-style constructions with tea house aesthetics, to take charge of the tea room and overall interior design. In addition to the permanent features, the seasonal touches of hanging scrolls, decorations and flowers are all breathtaking. Chef Murata is certain that Roan Kikunoi’s cuisine rivals that of its partner restaurant Kikunoi. And a major part of its appeal is the presentation element made possible with the counter seating. Bamboo shoots are a spring delicacy and Murata makes an elaborate process out of their presentation to whet his guests’ appetites. Bamboo grass is placed on charcoals, on top of which is placed half a large bamboo shoot in its thick sheath. The dish arrives before the guest just as the aromatic steam begins to rise, and the flavors are irresistible. 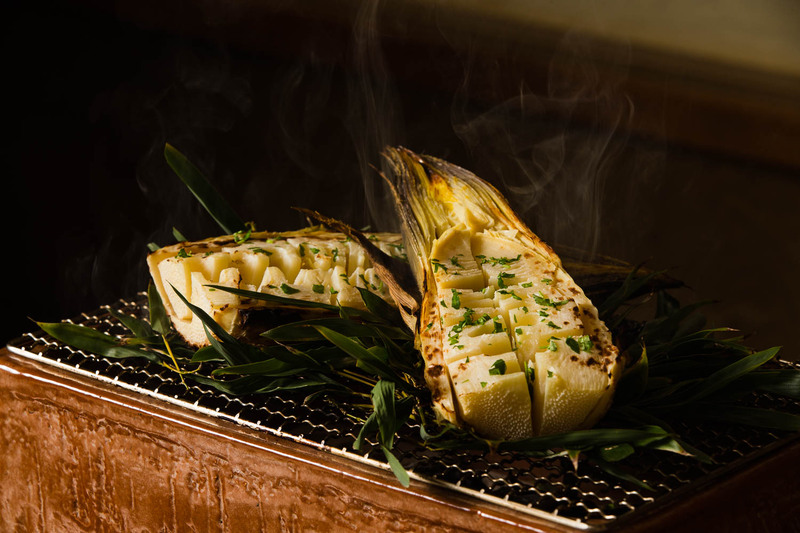 This is the yakimono grilled course using an earthen charcoal brazier made by Nakagawa Ippento from Shigaraki Kumoigama kiln, which first opened in 1765 and remains the favorite among top chefs around Japan for earthenware pots. The bamboo shoot dish demonstrates Chef Murata’s proficiency at the bold and splendid, but the hassun seasonal platter proves he is just as skillful at delicate knifework and measured placement. Sea bream sushi with young sansho leaves, cuttlefish, octopus, a kurumaebi prawn and firefly squid showcase ingredients from the sea, playfully and beautifully accented by ingredients from the mountains: a butterfly-shaped slice of mountain yam, the curled frond of bracken, miso-marinated avocado, fava beans, and decorative udo and lily bulb ‘petals’. In the degustation menu following the pattern of a traditional Kaiseki meal, next is the mukozuke featuring freshly caught Akashi sea bream with kinmedai fish in a refreshing ponzu gelee. The lidded dish reveals what may be more appropriately described as a work of art. It is a picture of spring with a parcel of tilefish enveloping glutinous rice, all wrapped in salted sakura leaves and steamed, and dotted with tiny crunchy rice crackers and pink sakura flowers. The aromas when you lift the lid instantly transport you to the perfect spot under the fully bloomed cherry blossoms. 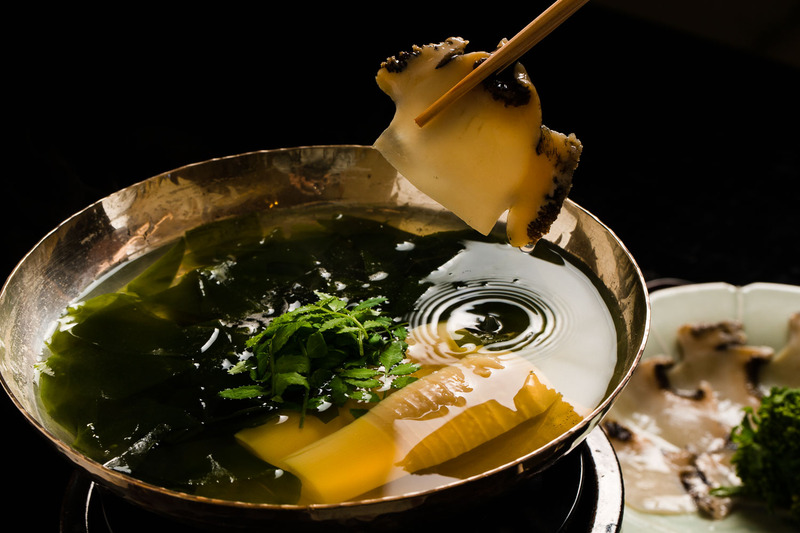 The shiizakana dish is a wonderful complement to sake with shabu-shabu of Shikoku abalone served alongside bamboo shoots, wakame and canola flowers, with an abalone liver dipping sauce, making the most of every part of each ingredient. The menu changes around the 25th of each month, condensing the flavors of each season into a beautifully presented story. The key seasonal ingredient is always found in the chef’s special earthenware pot steamed rice. Featured in spring are bamboo shoots, followed by Akashi sea bream, and then ayu sweetfish in the rainy season. A special Kyoto favorite, hamo daggertooth pike conger, makes an appearance around the time of Kyoto’s famous Gion Festival in July. Autumn brings heady aromatic matsutake mushrooms foraged from the mountains, then ikura salmon roe before winter’s harsh cold brings the chance to showcase root vegetables. The occasional appearance of premium Western ingredients like foie gras or truffles show the chef’s flexibility, surprising and delighting guests at the same time. 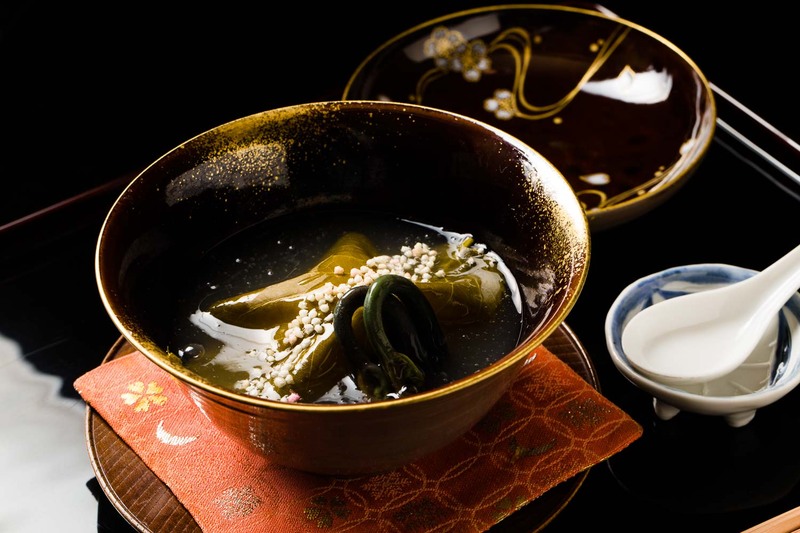 The key to delicious yet delicate dashi that forms the basis of Japanese cuisine is kombu kelp. Chef Murata uses the highest grade Kafuku kombu from Okui Kaiseido based in Fukui Prefecture, which first opened for trading in 1871. Added to this are the precious bonito flakes called katsuobushi, of which Murata uses the honkare variety made in Makurazaki, Kagoshima Prefecture, the most famous production area in Japan. These fine ingredients are secured through a dry goods store in Kyoto run by relatives of the producers themselves, and it is this tight-knit trust network that ensures a steady supply of premium ingredients such as these. Japanese-style creamy soup made from peas, spinach, spring cabbage and other greens makes a regular appearance on the menu, and the chef is also fond of developing tasty clear broth from vegetables. Kyoto vegetables come through contracted farmers in each region and bamboo shoots are delivered direct from the source in Ohara. Chef Murata is especially proud of the incredibly fresh seafood delivered daily from Awaji, bringing the bounties of the Seto Inland Sea to Roan: sea bream, sawara Spanish mackerel, kuruma ebi shrimp, and akagai red clams. Yoshiharu Murata was born in Kyoto in 1957. The second son in the famed Kikunoi group, there are six years between him and his older brother Yoshihiro, with two sisters in between. He remembers fondly how his siblings used to help with his homework when their parents were too busy with the restaurant. Murata first trained at Arate Saryo, which opened within the spectacular Korakuen Garden in Okayama Prefecture in 1933. 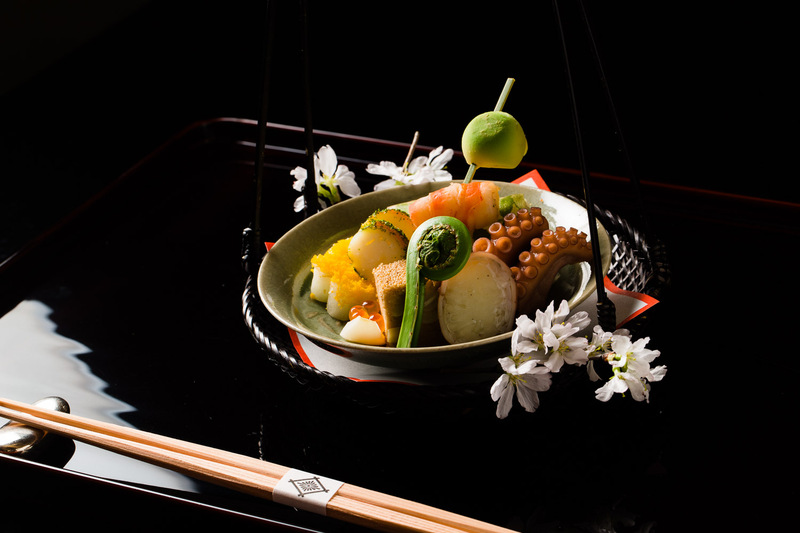 A formal and most traditional ryotei – restaurant of Japanese haute cuisine – every guest dines in a private room. His first job was fieldwork, tending to the restaurant’s own vegetable gardens at the riverside. In 1979, after four years of diligent training and study he returned to his home, working at the main restaurant of Kikunoi for one year before moving to Kikunoi Kiyamachi, the present-day Roan Kikunoi. He married at age 29 and his wife is currently in charge of reception at Roan Kikunoi. He has a very calm happy face that sets you at ease and assures you his food is cooked with love. He has great respect for his brother and the generations of history before them and maintains a great relationship with the main restaurant whilst also solidifying his own unique style. When talking of the future, Chef Murata’s hopes are threefold. 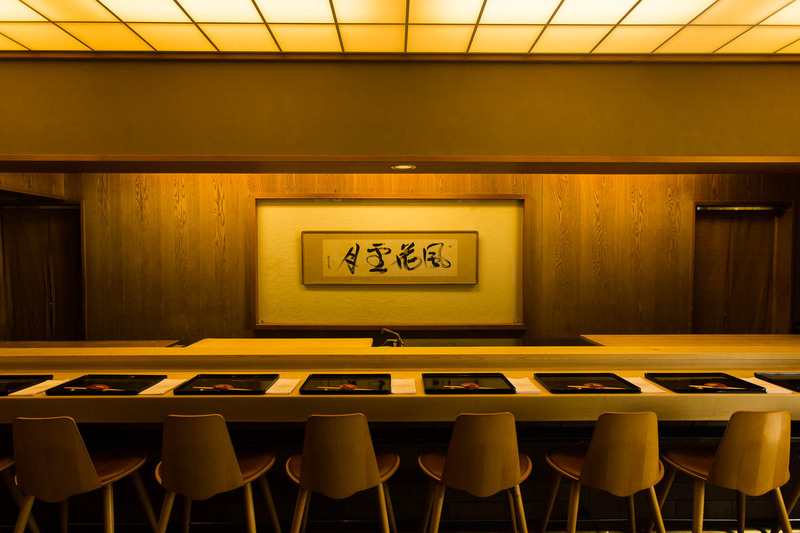 The first relates to the layout of Roan Kikunoi enabling much closer proximity to guests than the main restaurant, allowing Murata to serve authentic Japanese Kaiseki haute cuisine in a casual setting. It is this style that Murata hopes will attract and delight more and more customers from overseas. Secondly, many young, aspiring chefs, including the sons of some of Osaka’s greatest, come to train at Roan Kikunoi and the main restaurant. Murata wants to make sure that having left all they know at home these chefs can say at the end that, as expected, their experience was priceless because of what they learned at Roan Kikunoi. It seems he is well on his way to achieving that vision when you see the satisfied faces of all the young chefs in his kitchen. Finally, prior to Roan Kikunoi in this very same space stood Kikunoi Kiyamachi, Sushi Kiku, a sukiyaki restaurant and an oden simmered foods restaurant called Kikutei. Among these Murata dreams of one day reviving Sushi Kiku, and that prospect is something for us all to be excited about.